JEFFERSON CITY, Mo. (AP) — Republican U.S. Sen. Josh Hawley is facing questions about compliance with open-records laws while he was serving as Missouri's attorney general. At issue are emails between Attorney General's Office staffers and OnMessage consultants, who gave directions to official staffers shortly after Hawley assumed leadership in January 2017. The consultants later went on to work for Hawley's senatorial campaign against former Democratic Sen. Claire McCaskill. JEFFERSON CITY, Mo. (AP) — Missouri Sen. Josh Hawley has formed a political action committee to help other candidates get elected. ST. LOUIS (AP) — Missouri's former Democratic Sen. Claire McCaskill has a new job as a network political analyst for NBC News and MSNBC. JEFFERSON CITY, Mo. (AP) — Missouri Gov. Mike Parson said Wednesday that he is appointing the chairman of the House Budget Committee to serve as the next state treasurer, adding another link to a chain-reaction of office shuffling among Missouri's top elected officials. Republican Rep. Scott Fitzpatrick will succeed Republican Treasurer Eric Schmitt when Schmitt takes over for Republican Attorney General Josh Hawley. COLUMBIA, Mo. (AP) — Republican Josh Hawley will serve on the Judiciary, Armed Services and Homeland Security and Governmental Affairs committees when he takes office in the U.S. Senate next month. Hawley announced the committee assignments Wednesday. He also will serve on the Committee on Small Business and Entrepreneurship and the Special Committee on Aging. JEFFERSON CITY, Mo. (AP) — The Missouri GOP is calling on an attorney for the secretary of state to recuse herself from investigating outgoing Republican Attorney General Josh Hawley. Missouri GOP spokesman Chris Nuelle on Wednesday said Secretary of State Deputy General Counsel Khristine Heisinger has a conflict because she donated to Hawley's former rival, Democratic U.S. Sen. Claire McCaskill, and other Democrats. JEFFERSON CITY, Mo. (AP) — The Missouri Attorney General's Office is pushing back against allegations that Josh Hawley misused public resources to boost his successful U.S. Senate campaign as the secretary of state investigates him. First Assistant and Solicitor General John Sauer in a Monday letter called the complaint against the outgoing attorney general "a frivolous act of political harassment." JEFFERSON CITY, Mo. (AP) — Campaign finance reports show Missouri's Democratic U.S. Sen. Claire McCaskill spent roughly $40 million on her unsuccessful bid to keep her seat. McCaskill's campaign on Thursday reported spending about $5.6 million in the final weeks before and after the November election. JEFFERSON CITY, Mo. (AP) — State Rep. Holly Rehder says she's interested in becoming Missouri's next treasurer. The Sikeston Republican told The Associated Press on Wednesday that she let Republican Gov. Mike Parson's office know she's interested in the job. JEFFERSON CITY, Mo. (AP) — Jackson County Prosecutor Jean Peters Baker will be the Missouri Democratic Party's next leader. The Kansas City Star reports that Democrats elected Baker Saturday. She will replace Stephen Webber as state party chairman. Baker is assuming leadership following major Democratic losses. JEFFERSON CITY, Mo. (AP) — Republican Sen.-Elect Josh Hawley says he'll reintroduce a duck boat safety bill that his campaign rival Sen. Claire McCaskill proposed after a duck boat sank in July, killing 17 people. Hawley on Wednesday said he'll bring the legislation up again after he assumes office in January. JEFFERSON CITY, Mo. (AP) — Missouri's Republican Sen.-elect Josh Hawley has tapped his campaign manager to be his chief of staff. JEFFERSON CITY, Mo. (AP) — The Missouri Attorney General's Office is seeking court orders for Catholic dioceses to provide records as part of an investigation into potential clergy abuse. Spokeswoman Mary Compton in a Tuesday statement said the office wants personnel records, records relating to allegations of abuse and other documents from Missouri Catholic organizations. JEFFERSON CITY, Mo. (AP) — Gov. Mike Parson is scheduled to announce who will replace Josh Hawley as Missouri's attorney general. Parson is planning a news conference Tuesday morning to fill the attorney general's post, which Hawley held after being elected in 2016. Hawley will be moving to the U.S. Senate, after defeating Democratic incumbent Claire McCaskill in last week's election. Voters casting midterm election ballots in Missouri are divided over the state of the nation, according to a wide-ranging survey of the American electorate. As voters cast ballots for U.S. Senate and members of Congress in Tuesday's elections, AP VoteCast found that 49 percent of Missouri voters said the country is on the right track, compared with 50 percent who said the country is headed in the wrong direction. National Rifle Association President Oliver North is campaigning for Missouri's Republican U.S. Senate candidate Josh Hawley. North spoke to several dozen Hawley supporters during a Saturday rally in Imperial, about 30 minutes south of St. Louis. ST. LOUIS (AP) — Auditor Nicole Galloway is one of just two Democrats in statewide offices in Missouri, and if she's going to keep her job, she might need some help from the other one. Vice President Mike Pence has rallied hundreds of fellow Republicans in Kansas City to boost Senate candidate Josh Hawley in Missouri and governor candidate Kris Kobach in Kansas. JEFFERSON CITY, Mo. (AP) — Missouri Republican leaders are calling for a federal investigation into political mailings that slam Attorney General and U.S. Senate candidate Josh Hawley. The mailers do not have required disclaimers saying who is paying for them. COLUMBIA, Mo. (AP) — President Donald Trump implored voters on Thursday to reject Democratic Sen. Claire McCaskill and to instead install a Republican in her seat who would fully back his agenda. Trump appeared at a rollicking campaign rally in Columbia, home of the state's largest university, in an airline hangar draped in American flags. 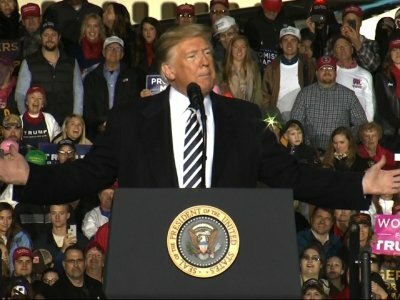 It was his second rally in an 11-stop, eight-state tour designed to boost Republican turnout ahead of Tuesday's crucial midterm elections. Missouri Republican Senate candidate Josh Hawley says that on Election Day, voters are going to call his opponent, Democratic Sen. Claire McCaskill, "fired." JEFFERSON CITY, Mo. (AP) — Missouri election officials are expecting voter turnout in Tuesday's midterm election to be the highest in more than two decades. Estimates submitted to the state by local election officials project that nearly 2.3 million people will cast ballots. That would equal almost 55 percent of registered voters. The last presidential midterm election to exceed that mark was in 1994, when 59 percent of registered voters cast ballots. JEFFERSON CITY, Mo. (AP) — Missouri's Republican Senate candidate Josh Hawley on Wednesday did not say whether he supports President Donald Trump's calls to end the right to citizenship for babies born to non-U.S. citizens on American soil but said he backs stopping "chain migration." Trump's campaign says he will rally supporters Thursday in Columbia to vote for McCaskill's Republican rival, state Attorney General Josh Hawley. COLUMBIA, Mo. (AP) — President Donald Trump is scheduled to be in Missouri next week for a campaign rally. The rally is scheduled for 6:30 p.m. Thursday at Columbia Regional Airport. Trump has made several appearances in Missouri in support of Republican Senate candidate Josh Hawley, who is running against incumbent Democrat Claire McCaskill in one of the nation's most closely-watched races. KANSAS CITY, Mo. 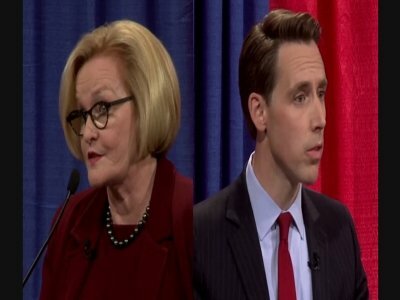 (AP) — Missouri Republican Senate candidate Josh Hawley blamed Democrats for a vitriolic political climate without offering any criticism of President Donald Trump during a Thursday debate with Democratic Sen. Claire McCaskill. The debate hosted by KMBC-TV in Kansas City marked the final time the two squared off before the pivotal Nov. 6 election, when the Missouri race could be pivotal to party control of the U.S. Senate. JEFFERSON CITY, Mo. (AP) — Missouri Democratic Sen. Claire McCaskill's campaign manager on Wednesday called for her Republican rival Josh Hawley to launch an investigation of footage of her campaign taken by a conservative group known for "sting" videos of liberal organizations.